Writer. Performer. Producer. Guide. Saxman. From putting down his own words and sounds to developing other artists, Dar’rell Green represents the best of what is music and the music business. The smooth, strong sounds of his art embody not only his presence in this business but also in life. Growing up in Indianapolis in a family with deep roots in the south – his father from New Orleans and his mother from Jackson, Mississippi – Dar’rell’s early sounds on the saxophone reflected those southern musical traditions and still influence his work. But growing up in the 1970’s in a house with a bass-guitar-playing-funk-master for a brother and a sister who played Classical piano, Dar’rell’s style soon integrated those musically diverse dimensions as well. Dar’rell’s older brother had an old school, R&B, funk band with a strong horn section. When Dar’rell was just little guy of 10 years old, he was invited to sit in and practice with them. By 14, Dar’rell grew a mustache, wore a hat and disguised himself with his dress, and started performing with the band at shows and clubs. Instructed not to speak but to just play his sax, that’s what he did. By the age of 20, Dar’rell was in Dallas playing all the clubs. Returning to Indianapolis, Dar’rell got involved with a group called Double Vision which resulted in his first CD project, then a second on his own. His fourth and current CD – Marinate the Groove – was preceded by a “best of” CD. Marinate the Groove is like a good family BBQ – lots of ingredients and lots of love. Ever faithful on this musical path, Dar’rell consistently performs across the county – opening for the likes of Ramsey Lewis and Kim Waters – has written music for several short films with an independent production house, and produces music. Between mentoring his exceptionally talented son – helping him develop as a musician and a young man – and guiding new artists, Dar’rell continues to invest in the future of this business and the people who love it. 2006- Dar'rell , took a back seat from the out front music scene . Dar'rell states" This year I really enjoy helping my son develop as a musicain and a person. To watch him play and develop his love for the music was fun this year. Yes i'm working on new projects , But this time I'm thinking more on what to put out there. Because there is so much music to play. 2005- Dar'rell still doing his "thang "behind the scene and center stage. Dar'rell states" Behind the scene is where the action takes place, it's where the big moves are made and being in the right scene is very important". From developing artists , writing music for short films , commercials, and working hard on his own CD projects as well as devloping new marketing strategies, Green states:" you must give your fan base the best you have in music. And at the same time not doing the same old things." We can be sure that Dar'rell 's talents won't be left only behind the scene, but the summer of 2005 he will again set the stage a BLAZE. 2004- Dar'rell in 2004 was on the move once again doing that "music thang ". It was a year of travel and music from California to Ohio . Dar'rell says,"the people you meet is a joy it lets you know that you can control the outcome of the music that you play and how people receive what you do , just by being true about what you do. " Fox 59 Morning Show had Dar'rell back for a second time for a smooth morning of jazz. 2003- The year FINALLY CD was born. January 2003 the CD was off and running , with the CD release party , which was followed by the first appearance on the Fox 59 Morning Show . Dar'rell states" The morning show helped us to really start pushing for that pie in the sky. It's funny when people and your fans see you on T.V. they are in some cases as proud as we where when we appeared on the show . That was a good feeling to know they care." 2002- The Groove moves on with the sounds of George Middleton and his band Musique . Dar'rell was special guest saxman on several of the bands shows, and one show for sure stands out from the rest. It was the opening for national recording artist Kim Waters, Dar'rell stated" Kim is a real person with unbelievable talent. I realized that day I had a long way to go. :-) To cap that off, back stage at a concert featuring Evertt Harp , Dar'rell told him of the experience of opening for Kim Waters ," and as I started to walk away ", Evertt simply said "well I'll see you soon and smiled , That made me feel pretty good, just thinking one day I could be on that grand stage and he ( Evertt) realized that I might not be that far away. "Marinate The Groove" Reviewed by RadioIndy.com! 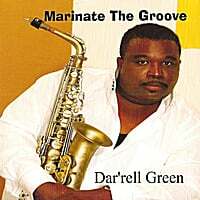 The exceptionally talented artist, Dar’rell Green, releases an outstanding CD, “Marinate the Groove,” that is comprised of well crafted R&B/Jazz songs. You will hear Green’s fantastic efforts on the sax as he performs with a rich, strong, and polished style. This album not only features some excellent sax instrumentals but mixes it up with a few songs that have some wonderful vocals. The song, “Closer 2 U,” moves with a soulful and melodic flair as Green plays his sax with a rich musical tonality. A special treat on this album is the song, “Sunday Drive,” as it features superb female vocals that let Green embellish this song with some wonderful expressive riffs. The title track, “Marinate the Groove,” is fashioned with a slow and grooving Hip Hop style as the deep and velvety vocals impresses with its easy flowing rhymes. Fans of Contemporary R&B/Jazz music will thoroughly enjoy the exquisite collection of songs this album, “Marinate the Groove,” has to offer.